All staff members were very helpful and professional, everything went smoothly. This has been my favorite vacation rental so far. It's neatly tucked away in the woods but is 15 minutes from attractions. The neighborhood is very quiet and the home is tastefully decorated and well-maintained. The creek is rushing and very relaxing. Breathtaking views! Wonderful amenities. This was our second visit and we will be back. I would definitely recommend this property (Almost like home cabin) Really good location and fully equipped, like if you were home. Very comfortable beds and a magnificent view. Easy to function fire place (x2). The pictures on line are beautiful but in person its much much better. Everyone exceeded our expectations! Great company to rent from! 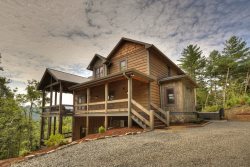 One of the best stays ever in Blue Ridge! Will definitely rent from Southern Comfort Cabins again! All of your team was great. Alisha was so awesome with our grocery shopping. Everyone was so sweet and accommodating and helpful with everything. We couldn't have asked for or had a better week of relaxation and refreshing for our anniversary. Thank you so very much for this wonderful place and for all of the services you provided. God bless you. The team was super polite, and helpful! Thank you! Our stay was wonderful. Exactly what we needed! Only downside would be we did not get to stay longer! Thanks again! Everyone was awesome and really helpful. I loved it. Im definitely renting with the company again. I could not figure out how to use the gas fireplace. The very helpful team member walked me through each step and within seconds it was working. This was a very relaxing vacation with an excellent location to go and grab food, entertainment, and within minutes be back at the cabin to enjoy why we came here in the first place. Excellent service and great staff. Very professional and polite. I was very satisfied with my stay. My family had a great time. Only down side was having to take a cold shower because the water heater started leaking. Other than that it was still a great experience. Our after hours girl (cant remember her name) was so wonderful! What could have been a real negative for us turned into a positive because of her sweet attitude! Our family loved it. The view was fantastic and the on site amenities were great. I only wish we were able to stay longer.